Written in a clear, understandable style, this new edition of Vibration Spectrum Analysis includes valuable information on using the latest techniques of spectrum analysis in solving problems and enhancing machine reliability. Vibration analysts, predictive maintenance specialists, and field mechanics will find it to be a key reference. A book good for both engineers and non-engineers alike. Offers new information on current instrumentation as well as additional appendixes, case histories and practice questions. Explains how to use instrumentation to monitor and interpret vibration signature. Provides information needed to identify potential problems before they cause machine failure. Emphasizes practical matters of developing an intuitive understanding of the nature of vibration, giving the reader the ability to attack any problem with a good chance of success. The Basics. The Fast Fourier Transformation Spectrum Analyzer-How it Works. Transducers for Vibration Measurement. Elementary Problem Diagnosis. 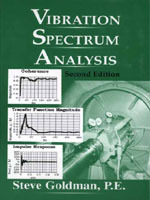 Dual-Channel Spectrum Analysis. Periodic-Condition Monitoring. Hardware and Software. Advanced Analyzer Functions. More Advanced Analyzer Functions. Appendices; Reading. Special Plots; Pulse Theory; Torsional Vibration; Condition Monitoring of Reciprocating Equipment; Balancing; Paper Machine Speed-Ups; Motor and Generator Vibration; Data Collectors, Spectrum Analyzer Operational Verification Procedures; Oil Analysis. Additional Questions. Index.